This is for my darling Aunt Rhoda. Hope you enjoy the recipe! Spätzle, [sh-pay-tzel] is a dish that was introduced to me when I was four or five years old from my German AuPair Tanja when she was living with us. Essentially, spätzle is a soft dough pasta, similar to the Italian gnocchi but made from a mainly flour base rather than potatoes (gnocchi). If you like gnocchi, you’re likely to be a spätzle fan. It became a go-to in our household when Tanja was living with us. Back then, I was a terribly picky eater. Spätzle was my dish of choice. More recently during a bout of nostalgic cook-book searching, I came across an old German cookbook with my sister and cousin and we decided to make some spätzle, it just made too much sense. 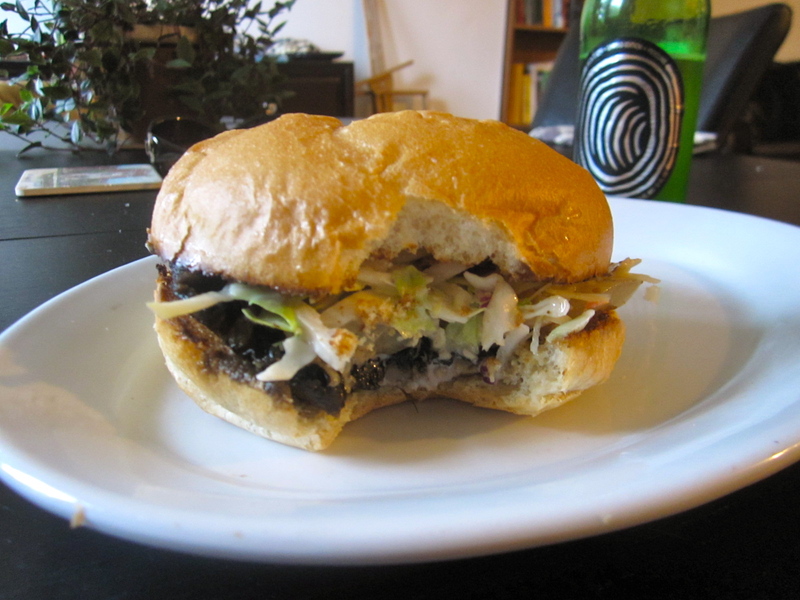 It was our favorite and we hadn’t eaten it in years. To be honest, I did a double take on the sauce. The sauce pictured is not the same sauce that I’m writing for the recipe here, but either way it will look the same. Part of cooking is trying things out, messing up, reformatting the recipe for the next time, and learning from mistakes. The recipe I used said to just pour cream all over the spätzle, then top with cheese and then onions. It was too bland to me, so I put in an open beer from the fridge. Problems? The cream, beer and cheese didn’t get cook together and therefor never gained the creamy consistency I was hoping for. The sauce that I made in this recipe is more of a bechámel-like white sauce with sharp cheddar cheese and less beer than the original version I made. When we make it we use this amazing spätzle-dough press gifted to use from Tanja. Nevertheless, some kinds of potato presses could work for this job, or after making the dough I’m about to describe you can alternatively roll out the dough and form it into small dumplings which you will boil the same way you boil the spätzle dough. LOTS of cheese, we used around 8oz of cheddar and shredded it. Mix the flour and eggs in a mixer with a dough hook or with your hands. 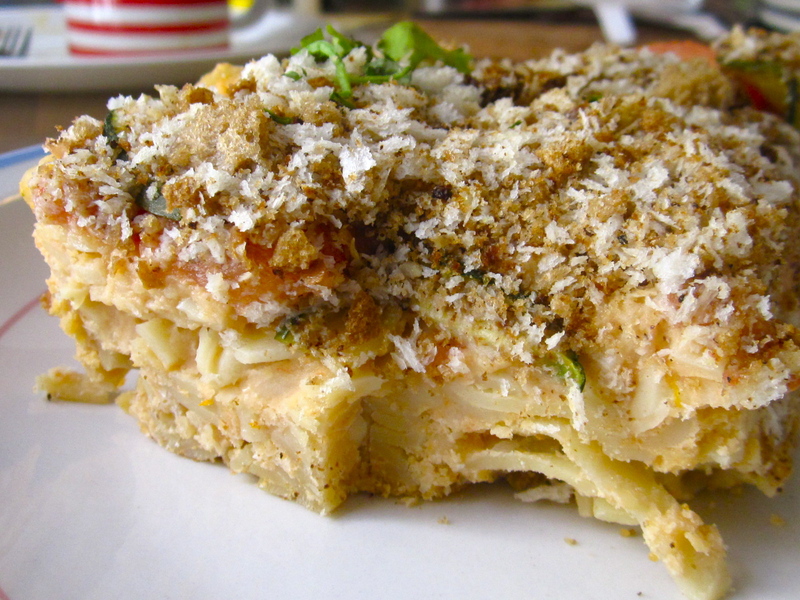 Add remaining ingredients and blend for several minutes. Dough should form, it should be a bit sticky but manageable. Then, in a large pot, bring about a gallon of water to boil with salt. If you don’t have a spätzle press, you’ll probably want to roll out your dough and make little dumplings which are slightly larger than gnochi dumplings. 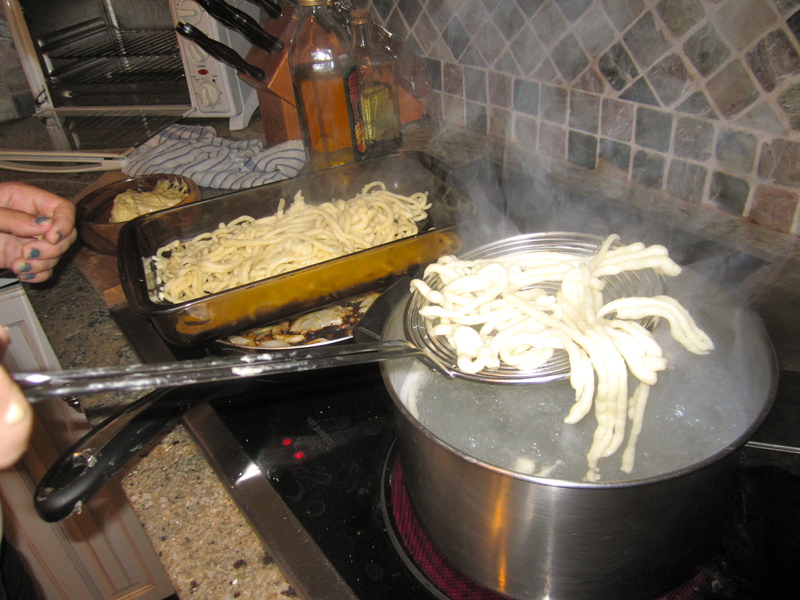 When the water has boiled, you can start to get your spätzle cooking. Over boiling water, get your cousin David who’s really strong to help you by squeezing the spätzle through the press into the water, and help him by cutting the dough from the press so it will fall in the boiling water. Within three minutes, the spätzle should float and be finished. You can take it out using tongs or a sieve thing like the one in this picture! 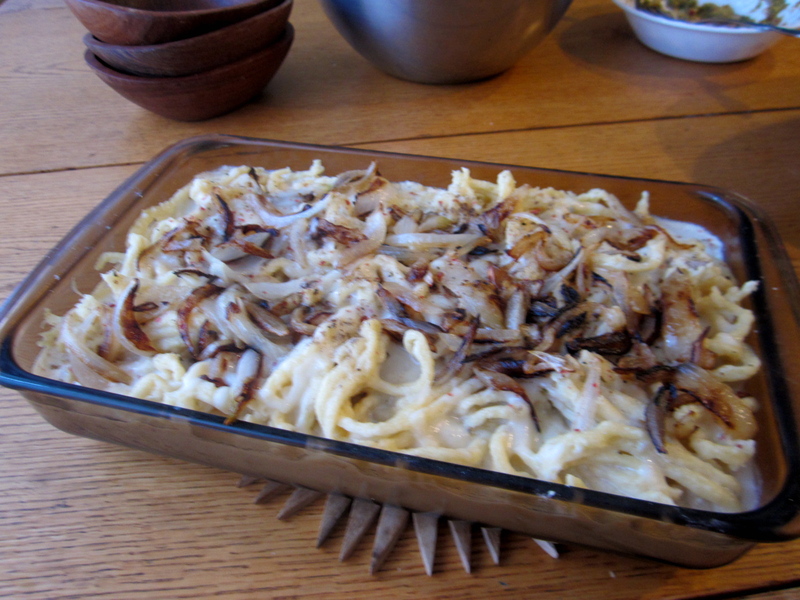 Fish out your Spätzle and place in a dish like the one pictured. 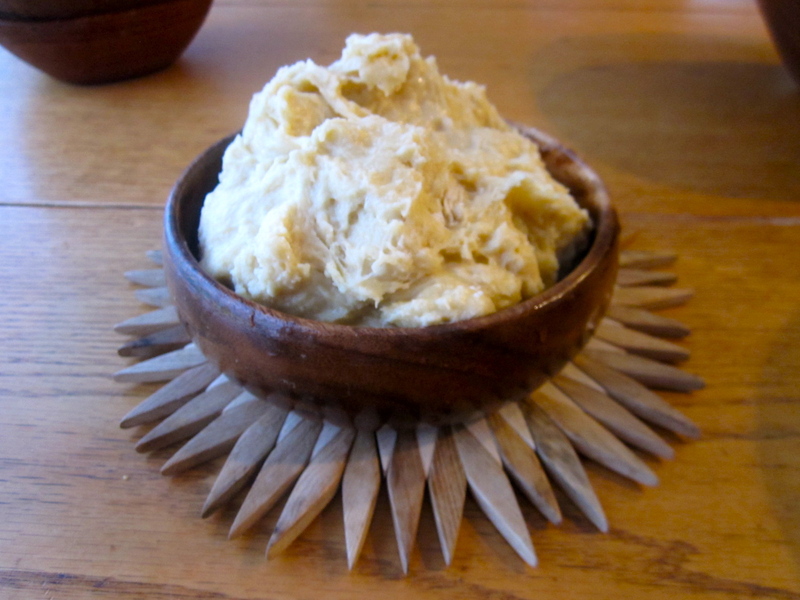 When you’ve made all your dough, you can move on to make the yummy bechámel-like sauce. For the sauce, cook the butter in a small saucepan until melted, and then carefully dust flour in little by little, whisking it with the butter. Once all the flour has been added, you’ll have a roux! Add the milk in a slow stream, constantly whisking it into the roux. Let this mixture come to a boil and thicken up, and add the spices. After it has been boiling for several minutes and the mixture sticks to the back of a wooden spoon, you know you’re ready. Add the beer. Then, add the cheese! Sauté some onions in butter and garlic. Set aside. Pour the cheese mixture all over your spätzle in the dish. Top it with the sauteed onions and fresh salt and pepper. Add some sausage if you like! Enjoy!